New Report Details The Horrors Of Life Under ISIS In Sirte, Libya : The Two-Way Human Rights Watch interviewed 45 Sirte residents for its report, which paints a vivid picture of how ISIS controls every aspect of life. ISIS has benefited from the chaos in Libya. 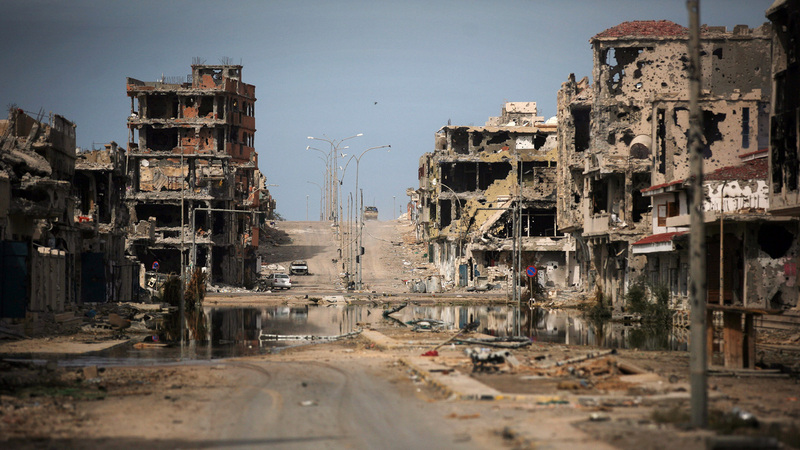 A view of buildings ravaged by fighting in Sirte, Libya, in 2011. Crucifixions, executions, food shortages, forced prayer: These are features of life in the ISIS stronghold of Sirte, Libya, according to a new Human Rights Watch report. ISIS has controlled Sirte since last August. The central Mediterranean city is the hometown of Libya's former dictator Moammar Gadhafi and the site of some of the final battles of Libya's 2011 revolution. Human Rights Watch interviewed 45 residents of the city for its report, which paints a vivid picture of how ISIS controls every aspect of life, "down to the length of men's trousers, the breadth and color of women's gowns, and the instruction students receive in state schools." "We were filled with hope. Then step by step, Daesh [ISIS] took over. Now we feel we are cursed," one resident who fled Sirte told HRW. The city drew international attention in February 2015 when an ISIS video showed its fighters decapitating 21 men, almost all of them Egyptian Coptic Christians who were kidnapped in Sirte. In its new report, Human Rights Watch says it documented 28 other killings by ISIS in the Sirte area between mid-February 2015 and mid-February 2016. These amounted to "scenes of horror — public beheadings, corpses in orange jumpsuits hanging from scaffolding in what they referred to as 'crucifixions,' and masked fighters snatching men from their beds at night." That's in addition to "scores" of rival fighters disappeared by ISIS and presumed dead, the rights group says. For example, Human Rights Watch documented the execution of 23-year-old Amjad bin Sasi, who was accused of "insulting God." According to two family members, "ISIS enforcers burst into bin Sasi's house and hauled him to jail for allegedly naming God while swearing as he brawled with a neighbor earlier that day." He was brought before an ISIS judge and, three days later, shot dead in a public execution. His family says they haven't received his body, because ISIS will not allow them to bury him in a Muslim cemetery — they consider him a non-believer. The report details other cases where people have been taken from their beds at night and executed for being suspected "spies." Others were killed for preaching against ISIS or for conducting "sorcery." ISIS keeps a tight grip on the day-to-day activities of the Sirte population, according to the report. Residents say morality police "aided by informants patrolled the streets threatening, fining or flogging men for smoking, listening to music, or failing to ensure their wives and sisters were covered head to toe in loose black abayas, and hauling boys and men into mosques for prayer and mandatory religious education classes." The militant group has taken control of the city's schools, port, air base, power station and radio station, the report says. At least two-thirds of Sirte's population has fled since ISIS took over. "The group is failing to provide basic necessities to the local population. Instead it is diverting food, medicine, fuel, and cash, along with homes it confiscated from residents who fled, to as many as 1,800 fighters, police and functionaries it has amassed in the city." According to the report, ISIS fighters have destroyed "at least 20 homes belonging to fighters from prominent local families who joined militias trying to ousted the group." And five times a day during prayer times, ISIS enforcers comb the streets, "herding residents into mosques and ordering merchants to close their shops from the start of the prayers of al-Asr in the mid-afternoon until the end of the prayer of al-Isha after nightfall, current and displaced residents said." They say the punishment for not attending is flogging, according to the report. Additionally, women are not allowed to leave their homes without a male relative and fully covered according to the ISIS guidelines. Likewise, "shop owners are whipped and their shops are closed if they receive an unaccompanied woman." Chaos has erupted in Libya since the ouster of Gadhafi, with two separate governments each claiming authority. A U.N.-brokered agreement signed in December was meant to unify the two into one. But as The Associated Press reports, the agreement only has "patchy support" and the government's head Fayez Serraj "has been ensconced in a naval base in Tripoli since his return to the country in March, unable to exercise much power beyond his office walls — much like his predecessors." ISIS, which first appeared in Libya in 2014, has benefited from Libya's ongoing chaos and now has multiple local affiliates. Human Rights Watch says the militant group controls some 120 miles of Mediterranean coastline, where Sirte lies. As NPR's Michele Kelemen reported, the U.S. is considering sending weapons to the U.N.-backed government. John Kirby, spokesman for Secretary of State John Kerry, says "it will take time to make sure weapons get to the right groups in Libya and don't just add to the chaos," Michele reported.